Enjoy a daily present from the Holiday Claw Machine! 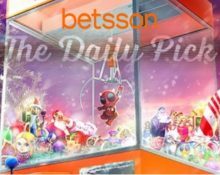 Good news today as Betsson launched their Holiday Claw Machine with enhanced daily picks for the festive season. This means nothing else than more bang for our buck with additional Free Spins, Bonuses and Wager Rewards throughout the next few weeks, culminating in two players winning an exclusive holiday to Portugal and Japan on Christmas and New Years Eve. Start today with a sensational 75 Free Spins on Gonzo’s Quest for a modest €20 deposit. 6th – 30th November 2017: November Blackjack Boost – Join any of the participating Betsson Group casinos for the last 4 days of the coolest LIVE Blackjack championship and you could take home a share of the €10,000 cash, every week or up to €800 cash, every day throughout the month. Play on the “Exclusive Blackjack 1-10 and Exclusive Blackjack VIP” live tables from Monday to Thursday during the promotion period and collect one of the card combinations to win cash prizes, up to twice daily. Additionally for every card, players earn points towards the leader board where the TOP20 players will receive a share of a €10,000 prize pool every Friday. Monday, 27th November 2017: Gonzo’s Free Spins – Wager minimum €25 on any slot to instantly receive 75 Free Spins on Gonzo’s Quest Slot. Spins must be played before midnight. Wagering requirement is 25x Free Spin winnings within one day. Tuesday, 28th November 2017: Free Spins Circus – Deposit minimum €25 in a single amount to instantly receive 100 Free Spins on Golden Ticket. WR is 25x Free Spin winnings within one day. Wednesday, 29th November 2017: Lightning Jackpot – Play Totem Lightning on mobile or desktop and get any “Quick Hit” jackpot win doubled, up to €500. Credited as bonus by 17:00 CET on Thursday with a 25x wagering requirement within five days. Thursday, 30 November 2017: 10,000 Mythical Free Spins – Wager minimum €10 on Hall of Gods™ to get an equal share of the prize pool, credited by 18:00 CET on Friday. Wagering requirement is 25x Free Spin winnings within one day. Friday, 1st December 2017: Hidden Cashback – Get a 100% cashback bonus on net losses when playing HIDDEN, up to €50. Cashback is credited by 10:00CET on Saturday with a 5x WR. Saturday, 2nd December 2017: Mayan Surprise – Wager minimum €10 on Mayana to instantly receive a surprise reward. Details will be sent to the players’ Betsson inbox. Sunday, 3rd December 2017: Howling Free Spins – Wager minimum €25 on any slot to instantly receive 75 Free Spins on Wolf Cub™. Spins must be played before midnight. Wagering requirement is 25x Free Spin winnings within one day.